Summary: This guide provides a solution to transcode P2 MXF to FCP with 4 audio tracks or selected audio tracks you want to preserve. MXF in an OP-Atom mode is part of the ensemble of specifications associated with the Digital Cinema Initiative. Panasonic P2 digital video cameras can output MXF OP-Atom files with DVC Pro encodings. 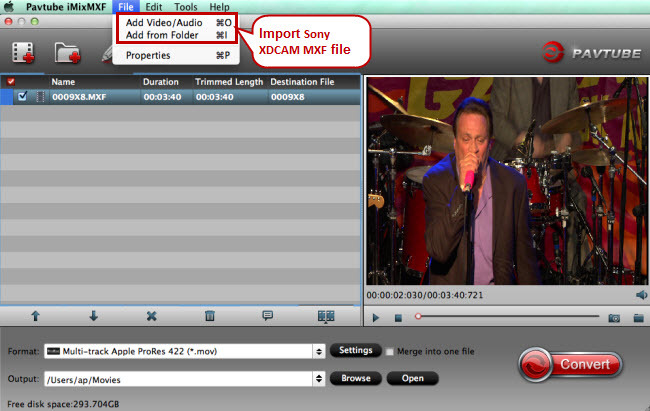 The P2 MXF files stores video and audio in seprate folder on a P2 card. "We're recording P2 natively so we have 4 audio tracks, and we'd like to keep those intact - with the conversion being MXF to Apple ProRes 422 HQ." Meanwhile, this P2 MXF to FCP Converter is good at reading MXF Video and Audio from P2 card. Only if you keep the whole file structure, the program can automatically load audio counterparts when you load MXF file. The finish video will be with audio and video in sync. No matter the P2 high definition MXF recorded with 2, 4, 8 or more audio tracks, the output ProRes won't loose audio tracks. 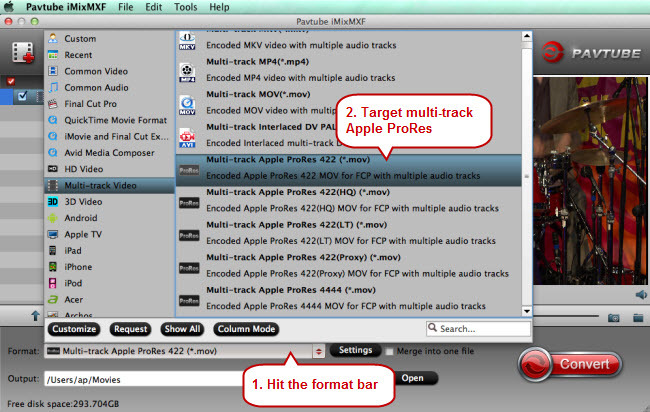 Below is a simple tutorial to help you export from P2 HD MXF to MOV with 4 audio tracks for FCP X. If you don't care about the audio tracks, you can turn to the more affodable multi-track MXF Converter for Mac. Click "add video" or "add folder" to load Op1a MXF. You can also directly drag files to the program. The program supports batch conversion and allows you capture images. Click "settings" to preserve separate 4 audio tracks in original MXF. If you don't want to keep all audio tracks, you can uncheck undesired ones. And you also can mix multi-audio tracks into individual track. Click "Start Conversion" icon to convert P2 card MXFto MOV with 4 audio tracks for Final Cut Pro X. You can preview output file when conversion completed. Then click "Open" button to locate the ProRes mov videos. Now you can import the converted MXF to FCP X for editing without rendering.